Sometimes I have the urge to buy something, anything. I get this craving to go and spend my money and feel the adrenaline rush of finding something that others don't have and imagining how cool everyone will think I am once I show them what I found. Do you ever get like that? I am thinking lots of people do as I really don't have another explanation for why certain things get bought. They don't really have any practical purpose. I know that people sometimes call this stuff "novelty items", but as soon as the novelty wears off, what do you have? I know what a marijuana plant would be useful for, but what it the purpose of marijuana if you can't smell and smoke it? What good is pot in a pot, if you can't inhale? "Our 4 foot plants are large enough to fit nicely and noticeably into a vacant corner. They will provide color and vibrancy that is needed in every living and working environment. 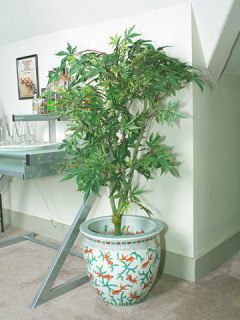 The 4 foot silk marijuana plant comes with 4 realistic looking buds, an attractive basket container, and moss to cover the base of the marijuana plant." Why would you ever buy snots? Even if they were heaven sent? I really don't know of a good use for snots, other than for the tissue industry. So who needs scented snots? "In our busy world it's easy to forget that miracles really do happen. 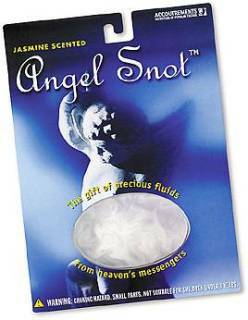 With its lovely scent and comforting texture, Angel Snot is a heavenly reminder of the magic at work in our everyday lives. We say "Bless You" when someone sneezes because medieval folk believed a sneeze was the soul escaping the body. Clearly, there is a strong connection between nasal mucus and the miraculous power of heaven's messengers. This beautiful jasmine-scented pearlescent [sic] substance is both sacred and fun to play with. Squish it, bounce it, stretch it -- just don't wipe it on the back of the couch." Some items are good joke items in that they make you laugh. 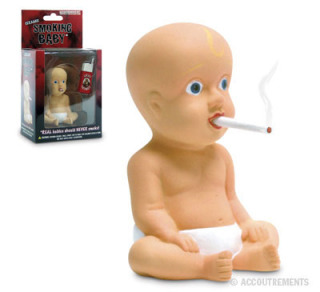 I just don't get the concept of why anyone would need or want a fake ceramic baby that smokes. Does anyone ever crave seeing a baby smoking? "Of all the things that shouldn't smoke, babies are at the top of the list...Ceramic babies smoking, on the other hand, are strangely appealing. ..Each infant comes with a pack of ten Li'l Smokes and has another one in its mouth, ready to light up and puff." Garbage is umm, garbage. Basically stuff that you are trying to dispose of from you life. So why do you need to package it up into a clear container to clutter up your shelves with? Do you need more garbage in your life? And are you willing to pay for it? 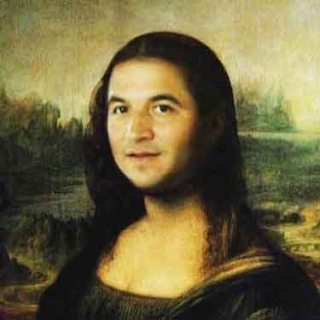 The Mona Lisa is a classic paiting know the world over for its beauty. Frankly, I find it a bit boring but I realize why its a classic. So why would you ruin it by adding a ugly mug of yourself? This is a plastic urine container device for your home? How big would your house have to be so the bathroom is too far from the desk that you could not get up to go to the bathroom? If you are really desperate, why couldn't you just use an old cup? "Shopping, gaming, chat rooms, cyber-dating - the internet is such an addictive and time-consuming force, who's got time to go? With the Internet Urinal, you'll never have to leave your computer again. Imagine the freedom - destroy your opponents on network Quake without taking a break; drink as many cans of Jolt as you want and still be able to make that last important trade before the market closes." I thought the whole purpose of a bonsai tree was to bring an element of beauty and peace into your life. I personally don't think constant reminders of car crashes do that. "CrashBonsai is the creation of ... an artist who is torn between the desire to create and destroy. 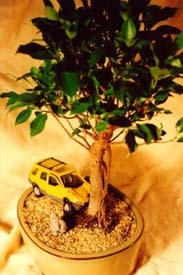 Recently, he has been making bonsai plants, and combining them with model cars and trucks which he has creatively smashed and melted, to create "CrashBonsai," little living car crash sculptures. ..Each model is unique, and individually disassembled, cut, melted, filed, smashed, then reassembled to replicate a real fender bender." Umm...the purpose of a clock is to keep accurate time and to make it readily accessible to the viewer. 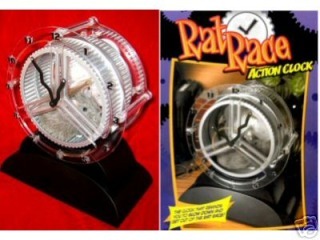 This clock only runs when the rat is running. So what good is a clock that does not keep time? "Looking for a constant reminder that you're stuck in a pointless, no-win, monotonous rut? Then place a Rat Race Clock on your desk.This clock is unlike any other -- It features a gray rat on an industrial treadmill. Once every minute, the mechanical rat begins run. The wheel is connected to an intricate series of 12 gears -- So when the rat wheel goes around, it makes the clock's minute hand move 1-minute forward." What is the point of a bicycle, which is for exercise, to make it solar powered? What good is a bicycle that powers itself? "[T]he first all Solar electric bicycle driven completely from power derived from the Sun’s Rays. The E-V Sunny Bicycle has light absorbing Solar panels built right into the Wheels, creating continual power from the Sun’s Rays, and maintaining a constant charge to the batteries. The bike is propelled by a 500 watt front hub motor. Turds are not decorative items that you try to beautify. Why then a device that you can use to shape your turds. Are you actually going to share the results of your arts and craft project with someone else? And as a bonus, by ordering online, we'll throw in a Safe-T-Floss™ Retraction Cord. Incredibly useful if your Turd Twister gets stuck somewhere it shouldn't be in the first place." All the "see it here" links are broken... is that because these products don't really exist? Once every minute, the mechanical rat begins run. [...] So when the rat wheel goes around, it makes the clock's minute hand move 1-minute forward." What about this says to you that the item doesn't keep time? What is the link for the custom Mona Lisa? Darn it - we've managed to lose all our links in this article. When it says See it hear, you should be able to click through. We'll get on it. Thanks for letting us know. Yeah, I can see how a MECHANICAL rat would get tired.